The aim of this study was to assess the value of serum ferritin among protein energy malnutrition (PEM) patients with iron deficiency. Iron deficiency is the most common micronutrient deficiency seen in PEM and a common cause of morbidity and mortality in this condition. This was a case–control study in which participants were children diagnosed with PEM and controls were children with normal nutrition. Ninety consented participants and controls participated in the study with informed consent obtained from caregivers. Full blood count and examination of a peripheral blood smear, as well as serum ferritin concentration, was analysed by enzyme-linked immunosorbent assay. Data entry and analysis were carried out with a micro-computer using the SPSS, version 16, software packages. The mean age of the children with PEM was 22.7 ± 14.4 months. In the participants, prevalence of iron deficiency was 24.4%, whereas that of iron deficiency anaemia was 16.6%. Mean serum ferritin levels were significantly higher in the controls compared with participants (P = 0.000). The sensitivity and specificity of serum ferritin was 100.0% (95% confidence interval), and the likelihood ratio was 0.00 (95% confidence interval). Patients with PEM were found to have high prevalence of iron deficiency anaemia and low serum ferritin levels. The sensitivity and specificity of serum ferritin levels were found to be high among PEM patients with iron deficiency anaemia. Iron deficiency anaemia is the most common micronutrient deficiency seen in children in Nigeria and worldwide; it affects over two billon people including children with protein energy malnutrition (PEM) worldwide . PEM is a leading cause of morbidity and mortality among children in the developing countries carrying the highest burden ,. PEM is usually an outcome of both macronutrient deficiency and micronutrient deficiency coexisting . Iron is the most common of the micronutrient deficiency seen in PEM ,. Being the most common, nutritional anaemia is usually invariable in children with PEM, and thus it has to be anticipated and managed. However, the laboratory diagnosis of iron deficiency among PEM from various previous studies has been inconclusive. Different modalities have been suggested based on the sensitivity and specificity of various available diagnostic tools. Laboratory tests such as serum ferritin, red cell protoporphyrin, transferring saturation, mean cell volume, or red cell distribution have been used to a great extent to determine iron deficiency . A systematic overview of the diagnostic values used in the evaluation of iron deficiency anaemia showed that serum ferritin was by far the most powerful test for the diagnosis of iron deficiency, outperforming red cell protoporphyrin, transferring saturation, mean cell volume, or red cell distribution . Serum ferritin, which indirectly reflects total body iron stores, is routinely ordered in the evaluation of anaemia . Low serum ferritin is highly specific for iron deficiency anaemia, and is much less invasive than the gold standard . However, test properties differ for populations of patients with inflammatory, liver, or neoplastic disease, because serum ferritin is an acute-phase reactant . PEM is also a condition in which acute-phase reactions such as serum ferritin are in circulation because of the presence of infection and other inflammatory response. Furthermore, in severe PEM, despite the fact that dietary deficiency of iron is prevalent among children with PEM, hepatic iron and bone marrow-free iron are usually elevated, as there is a reduction in the concentration of serum protein especially the transport protein, which increases the circulation of free iron, therefore making the use of serum ferritin as a diagnostic tool of limited value . Test properties of serum ferritin in other conditions such as neoplasms to aid appropriate interpretation of values have been determined in a previous study . However, the value of serum ferritin of severe PEM is still inconclusive. This article examines serum ferritin levels of children with PEM with specific objectives to determine the prevalence of iron deficiency and iron deficiency anaemia in PEM in relation to feeding practices, the sensitivity and the specificity of serum ferritin in the diagnosis of iron deficiency in PEM. The study was a case–control study in which participants were children diagnosed for PEM and controls were children with normal nutritional status without haematological or infectious conditions. It was conducted in the Emergency Paediatric Ward of University of Ilorin Teaching Hospital among children (6–59 months old) with malnutrition. All consecutive admissions into the Emergency Paediatric Unit with a diagnosis of PEM based on the welcome's classification were enroled after obtaining consent by the caregivers, whereas PEM patients with underlying haematological conditions such as sickle cell disease or chronic disease, or PEM patients on iron supplements, were excluded. Controls were healthy children attending the routine clinic without haematologic or infectious condition and not on iron supplement. The study was approved by the Ethics and Research Committee of the University of Ilorin Teaching Hospital and informed consent was also taken from the participants. Using a prevalence of 10% from a previous study , the minimum calculated sample size was 70 participants; 90 participants each were selected for the study and control groups, with a total of 180 participants for the study. Under strict aseptic conditions, after cleaning the blood collection site thoroughly with 70% alcohol, 5 ml of venous blood was collected by venipuncture using a fixed hypodermic needle. Three millilitres of the withdrawn blood was decanted into a sample bottle containing EDTA and gently mixed to prevent clotting, whereas the remaining 2 ml was decanted into a heparinized bottle, which was left to stand for 2 h; the serum was separated by centrifugation and serum was decanted into another bottle and frozen at −20°C. Automated blood analyser model/Symax KX 21 (Bellport, NY, USA) was used to analyse the full blood count, whereas a low-power examination of a peripheral blood smear was performed with a ×50 or ×100 objective of the microscope, and the area of morphology was examined. Serum ferritin concentrations were analysed by enzyme-linked immunosorbent assay using the Nova Path Ferritin kit . Serum was prepared from whole blood specimen collected under aseptic condition into an EDTA bottle. Serum was capped and stored at 20°C. Iron deficiency was defined as serum ferritin levels below 31 ng/ml, whereas iron deficiency anaemia was defined as haemoglobin less than 11 g/dl and serum ferritin less than 31 ng/ml ,. Anaemia was defined as haemoglobin less than 11 g/dl. Mean corpuscular volume 70–74 fl was taken as a normal range. Values less than 70 fl were taken as microcytosis and >74 fl as macrocytosis . Data entry and analysis were carried out with a microcomputer using the SPSS Epi info, version 3.5, software packages. The mean age of the children with PEM was 22.7 ± 14.4 months (range: 9–59 months) compared with the mean age of 29.3 ± 16.9 months (range: 6–59 months) in the controls, and the difference was not significant (P = 0.08) [Table 1]. Fifty-six per cent of the children with PEM belong to the low socioeconomic class (IV and V). The participants were of a lower socioeconomic class compared with the controls (P = 0.00001). Sixty-five (72.2%) PEM children were not exclusively breastfed, while the mean age for the commencement of complementary feeds was 5.1 ± 1.93 months in children with PEM compared with 5.6 ± 2.4 months in the controls, and the difference was not significant (P = 0.126). Over 75% of the PEM cases were fed with guinea corn gruel, 11.1% with fortified gruel, 10% with maize gruel and only 1.1% added milk to the feeds. 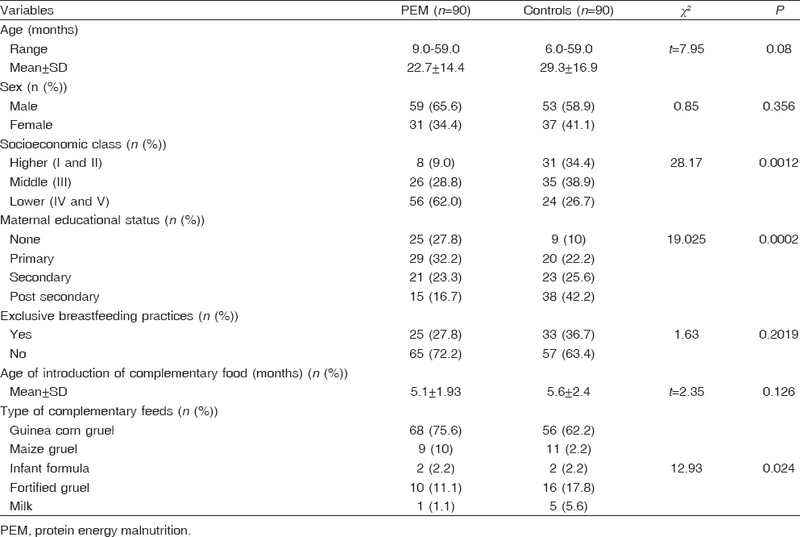 The children with PEM were fed more nonnutritive feeds when compared with the controls (P = 0.02). 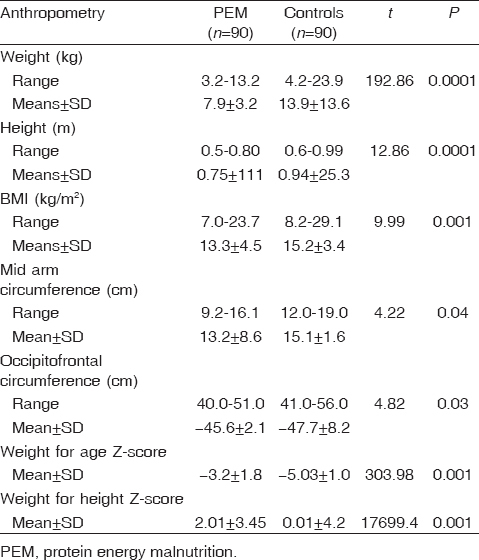 The mean values for weight, height, BMI, mean arm circumference, as well as the Z-scores for weight for age and weight for height, were all significantly higher in the controls compared with the PEM children [Table 2]. The overall prevalence of anaemia in PEM was 74.4%, with the underweight children having the highest prevalence. The prevalence of iron deficiency was 24.4% in the children with PEM, whereas that for iron deficiency anaemia was 16.6% in these children. Microcytic–hypochromic anaemia was the most common anaemia as it accounts for 84.4% of the type of anaemia seen [Table 3]. The mean serum ferritin levels were higher in the controls compared with PEM cases (P = 0.000) [Table 4]. The mean serum ferritin was significantly higher in girls (P = 0.00001). Children with marasmus had the highest mean serum ferritin level of 600.5 ± 392.6 ng/ml, whereas those with kwashiorkor had the lowest level of 165.5 ± 6.2 ng/ml, and the difference was statistically significant (P = 0.009) [Table 5]. The sensitivity of serum ferritin was 100.0% [95% confidence interval (CI)], whereas specificity was 100.0% (95% CI). Likelihood ratio was 0.00 (95% CI) and positive predictive value was 100.0%, negative predictive value was 100.0%, whereas disease prevalence had a predictive value of 16.67% [Table 6]. A majority of the participants belong to families of low socioeconomic class and mothers with low level of education. The practice of exclusive breastfeeding was very low among participants and the controls, and about 85% of the participants were fed common staple food such as unfortified maize gruel. These findings are major risk factors for the development of malnutrition and nutritional anaemia in PEM as found in several other studies ,. A high prevalence of anaemia (74.4%) among children with PEM was found in this study, and was in consonance with previous studies in which anaemia was said to be a common feature of PEM ,,. Microcytic–hypochromic red cells were most commonly observed in PEM from this study; this is in contrast to previous studies in which anaemia seen in PEM was normocytic normochromic ,. Several factors have been implicated in the aetiology of anaemia in PEM, and these include deficiencies of iron, folate, vitamin B12, infections, blood loss, haemolysis, erythroid hypoplasia and adaptation to lower metabolic oxygen requirements and decrease in lean body mass . Microcytic–hypochromic anaemia found to be the most common in this study can be attributed to deficiency of iron, which is a common cause of microcytic–hypochromic anaemia. This finding strongly supports the fact that iron deficiency is the most common cause of nutritional anaemia in this part of the world . Iron deficiency anaemia seen in these children from this study can be attributed to several factors such as inadequate intake, problems of absorption and utilisation. The type of food eaten by a majority of the PEM children in this study can also be a factor for the high evidence of iron deficiency anaemia recorded in this study. Eighty-five per cent of PEM children were fed common staple food such as maize gruel with low iron content of 0.02 mg and guinea corn and millet, which does not contain any iron at all; these provisions are quite below the recommended daily requirement of elemental iron, which is 3–6 mg/kg/day . The prevalence of iron deficiency anaemia is 16.6% in this study; this finding is higher than values documented in previous studies ,. This higher prevalence of iron deficiency anaemia in this study can result from early age of introduction of complementary feeds, and nutritionally poor complementary feeds given to the children, as well as low practice of exclusive breastfeeding recorded in the study population. The study revealed a lower mean serum ferritin level among the malnourished in the acute phase compared with controls. This is in contrast to previous studies in which a higher serum ferritin value was observed in PEM as compared with controls , even though the participants studied were in the recovery phase of PEM. However, this study is in conformity with other studies that assessed the serum ferritin levels in PEM in the acute phases and found that serum ferritin was lower in the children with malnutrition ,. Its level is expected to be elevated in the phase of an acute ongoing infection or inflammation. The studied population was in the acute phase of the illness and the prescience of ongoing infection cannot be excluded, and thus the expectation was an elevation in the serum ferritin, which is an acute-phase reactant in these patients. However, because there is a real depletion in the store of these acute-phase reactant iron, the expected response cannot be observed; thus, for PEM, this low serum ferritin level is a true reflection of iron deficiency in these children, as serum ferritin is the best indicator for iron deficiency because a decrease in the amount of stored iron is the only known cause for low serum ferritin result . The diagnosis or establishment of iron deficiency anaemia in children with PEM usually brings about diagnostic challenges. The choice of the type of appropriate investigative tool depends on many factors. Some other study on the usefulness of serum ferritin in diagnosis iron status concluded that serum ferritin has a limited value as an indicator of iron status in participants with PEM, presumably because of the frequency of infections and of hepatocellular damage in such participants , although most others have been inconclusive . The use of serum ferritin for the diagnosis of iron deficiency anaemia in PEM from this study, however, reveals that serum ferritin has a very high sensitivity in establishing the presence of iron deficiency anaemia in these groups of children. The chances or probability that serum ferritin alone will pick iron deficiency in children with PEM is very high. This has been found in another study, although not in children with PEM, in which serum ferritin was by far the most powerful test for the diagnosis of iron deficiency, outperforming the other methods ,. A high specificity was also found from these studies; this implies that the probability of serum ferritin to identify iron deficiency correctly in PEM was high. This further corroborates previous studies and documentation that serum ferritin is highly specific for iron deficiency ,. Furthermore, a high positive predictive value also indicates that the probability that low serum ferritin will identify iron deficiency anaemia if present is high. Our study concluded that anaemia, particularly microcytic anaemia, was common in children with PEM, and this finding is more attributed to the poor feeding practice seen. The study also found a low serum ferritin in children with PEM compared with controls, and finally serum ferritin has a very high sensitivity and specificity in detecting iron deficiency anaemia in children with PEM. The study recommends that the diagnosis of iron deficiency anaemia is common among malnourished and it should be sought for because of its long-term effects on cognition and development. Its diagnosis can be established by the combination of haematological and biochemical parameters such as serum ferritin to enhance diagnosis. Future studies for other possible sensitive test that can be utilised for screening and diagnosis of iron deficiency anaemia in PEM especially in the developing country where the condition is prevalent is strongly advocated. Continuous nutritional education and campaign on exclusive breastfeeding and introduction of appropriate complementary feeds should be intensified. These would help reduce the risk of both overt and obvious malnutrition and its presence effects. The authors wish to thank the authority of the University for Ilorin Teaching Hospital where the study was carried out. We are also grateful to the parents and care giver who accepted to participate in this study. Finally, we are grateful to consultant, residents and nursing staff of the Paediatrics Department for their various contributions to the study. Federal Ministry of Health guidelines for infant and young children feeding in Nigeria. 2005. Available from: http://www.health.gov.ng/doc/IYCFPolicy.pdf. [Last accessed 2016 May]. Hassan FM, El-Gendy FM, Badra HS, Kamal Eldin SM, Elsayyad DMM. Evaluation of iron-deficiency anemia in infancy. Menouf Med J 2016; 29:269–274. Mary EP. Protein energy malnutrition, path physiology, clinical consequences and treatment. In: Walker AW, Christopher D, Watkim JB, editors. Nutrition in paediatrics. London: Blackwell Waterson; 2008. pp. 171–184. Warrier RP. The anemia of malnutrition. In: Suskind RM, Suskind LL, editors. The malnourished child. Vol. 19. New York: Lippincott-Raven; 1990:pp. 61–72. Guyatt GH, Oxman AD, Ali M, Willan A, Mcllroy W, Patterson C. Patterson, laboratory diagnosis of iron-deficiency anemia: an overview. J Gen Intern Med 1992; 7:145–153. Kratz A, Ferraro M, Sluss PM, Lewandrowski KB. Case records of the Massachusetts General Hospital. Weekly clinicopathological exercises. Laboratory reference values, N Engl J Med 2004; 351:1548–1563. Heath AL, Fairweather-Tait S, Worwood M. Reference limits for haemoglobin and ferritin. If it's not broken, don't fix it. Br Med J 2001; 323:806–807. Wickramasinghe SN, Gill DS, Broom GN, Akinyanju OO, Grange AO. Limited value of serum ferritin in evaluating iron status in children with protein-energy malnutrition. Scand J Haematol 1985; 35:292–298. Koduri PR, Shah PC, Goyal V. Elevated serum ferritin levels: associated diseases and clinical significance. Am J Med 1996; 101:121–122. Hammidu JL, Salami HA, Ekanem AL, Hamman L. Prevalence of protein energy malnutrition in Maiduguri, Nigeria. Afr J Biomed Res 2003; 6:123–127. Engvali E, Van Vunakis H, Langone JJ. Method in Enz. Vol. 70. New York: Academic Press; 1980: 419–492. Brady P. Iron deficiency anemia: a call for aggressive diagnostic evaluation. South Med J2007; 10:967. Ellen B, Paul H, Bertram L Nutritional anaemias. In: Walker AW, Christopher D, Watkim JB, editors. Nutrition in peadiatrics. London: Blackwell Waterson; 2008. pp. 701–711. Daniel R, Peter AL, Rachelle N. Iron deficiency aneamia. In: Hay W, Levin M, Deterding R, Abzug M, RR Deterding, editors. Current peaditricdiagnosis and treatment. Blacklick, OH, USA: McGraw-Hill, Lange Medical Books; 2005. pp. 862–863. Atair R, Mannan MA, Hamidu RM. Influence of infection on iron profile in severely malnourished children. India J Pediatr 2007; 8:20–23. Ojofeitimi EO. Principles and practice of nutrition for community health workers. Ibadan: None Publishers; 2008. pp. 102–105. Bede C, Ibe I. Overview of complementary feeding. J Child Health 2007; 1:23–40. Barakat T, Elwalily A, el-Nawawy A, Barakat S, Elwalily T, Abdel-Moneim Deghady A, Hussein M. Evaluation of erythropoiesisin protein energy malnutrition. East Mediterr Health J 2002; 8:2–3. Abidoye RO, Sikabofori A. Study of prevalence of protein energy malnutrition among 0–5 years in rural Benue State, Nigeria. Nutr Health 2000; 13:235–247. Alemnji GA, Thomas KD, Durosinmi MA. Haematogram and serum iron status of malnourished Nigerian children. East Afr Med J 1995; 72:605–608.